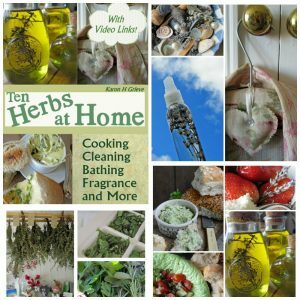 Ten Herbs At Home is the PDF Ebook version of my ever popular So Easy Herbal which is available through Amazon in hardback and Kindle. So why buy this Ebook version? In this Ebook version you will find links to 2o videos tutorials showing you exactly how I do everything in real time with no steps skipped. I love to show people how I make things, especially when I can demonstrate just how quickly and easily these things are. That’s why you’ll be able to just click on links in this Ebook to take you straight to the relevant video. Making cool drinks including my famous strawberry and lavender gin! You don’t even need a garden as you can grow your herbs in a window box or in pots on the patio or at the back door. 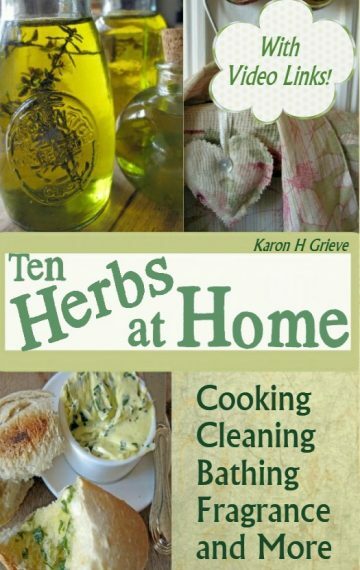 There are over fifty different recipe ideas ranging from tasty herb butters and oils to jazz up your cooking, simple sleep blends to help you reach the land of nod the natural way, gorgeous ideas for beneficial bath goodies, home fragrance hints and tips and even my favourite recipe for Strawberry And Lavender Gin! Learn to really make the most of herbs and enjoy going green without breaking a sweat. “At last, a simple guide to using and enjoying herbs! This is a back to basics guide, and I love the fact that Karon has made this accessible to all, even those without a garden.” Janey Lee Grace; Bestselling author Look Good Naturally-without ditching the lipstick. “Concise and accessible, the ideas here all look appealing and, better still, are simple to do.” Lynn O’Rourke; Scotland on Sunday. Slow down and take pleasure in herbal homecrafts. People love receiving handmade gifts and I’ll show you simple ways to use your herbs to really make useful and pretty gifts that will be appreciated by all your family and friends. From herb infused oils and vinegars that will make any salad sing, to herb coated candles, fragrant wardrobe sachets to keep those dreaded moths at bay and simple old fashioned pot pouris. Just click on the Download Now link and your Paypal account will organise any currency changes for you.